If I had to pick one place to go back to from our trip this would be it. 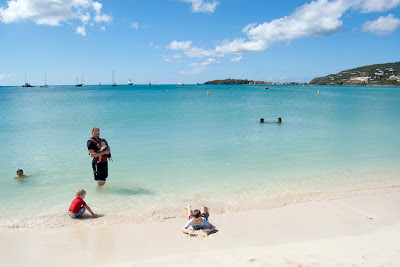 I'm not sure I'd ever even heard of St. Maarten before this, but it was so beautiful. It was quite warm out and a lovely Italian lady let me use one of her beach chairs to sit under the umbrella and nurse the girls so the boys could play a bit longer. 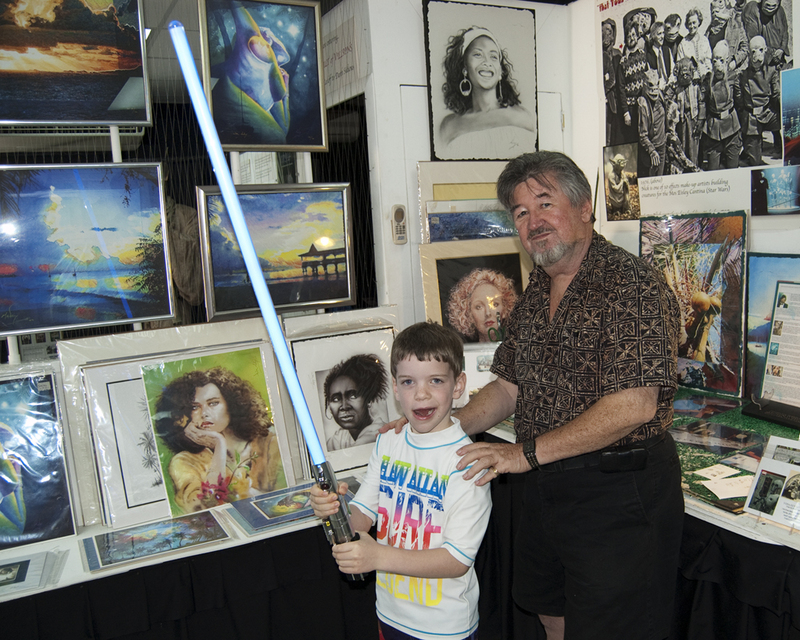 Her son is to the left of Brian in the picture above and Cory sort of made friends with him although I'm not sure they could understand each other. Poor Noah came up to me and was shaking and complaining of being cold. I thought he had gotten too much sun (although we'd only been there an hour) so was having him drink my water. 2 days later he ended up going to see the ship's doctor to get antibiotics because his neck was so swollen. 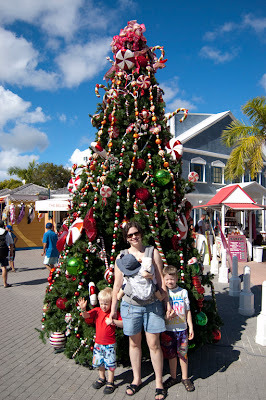 She thought he had mumps, but upon our return, a visit to the doctor, and then a baby sister with strep throat we think we finally know what he had. 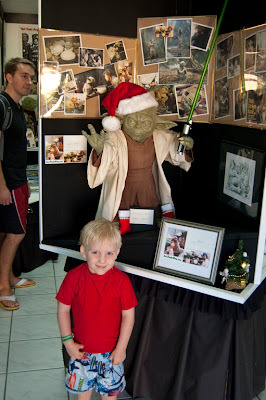 Even sick Noah loves Yoda! 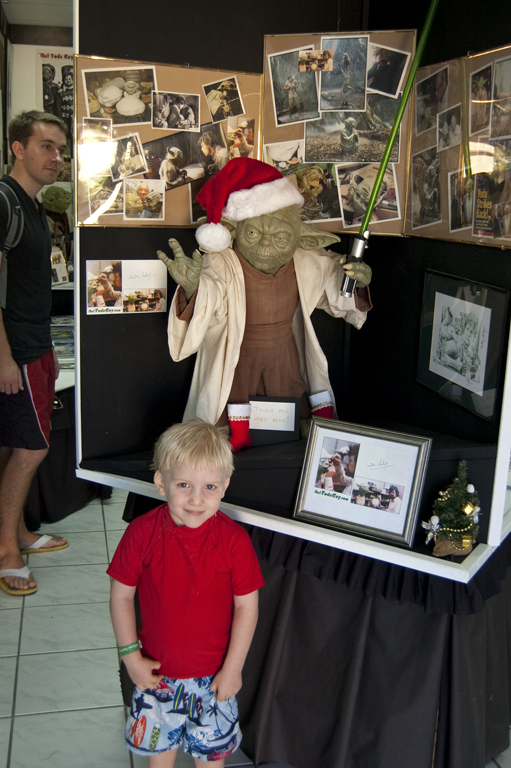 Our time on the island once again was short so we wandered through the main street a bit and came across the most random of all museums... That Yoda Guy. 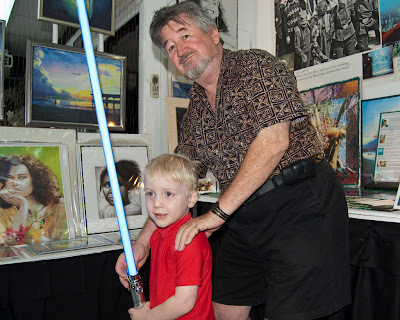 This man was one of the original creators of Yoda for Star Wars and he has his private collection (it's quite extensive) of art and artifacts from the movies in an upstairs store. 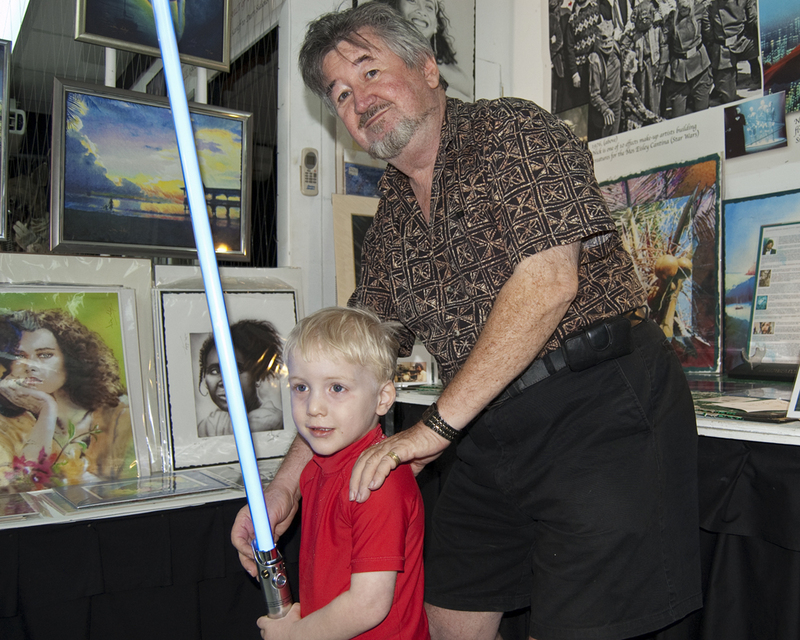 For the price of a gift we purchased for my parents (the whole reason we even found the shop) he let the boys hold his light saber and take pictures. He was very serious that they not "cut" anything with the lit part! And he told us that in the original movie the light saber handles were rubber and plastic and anything they had lying around the shop that would hold a broomstick as the saber part! 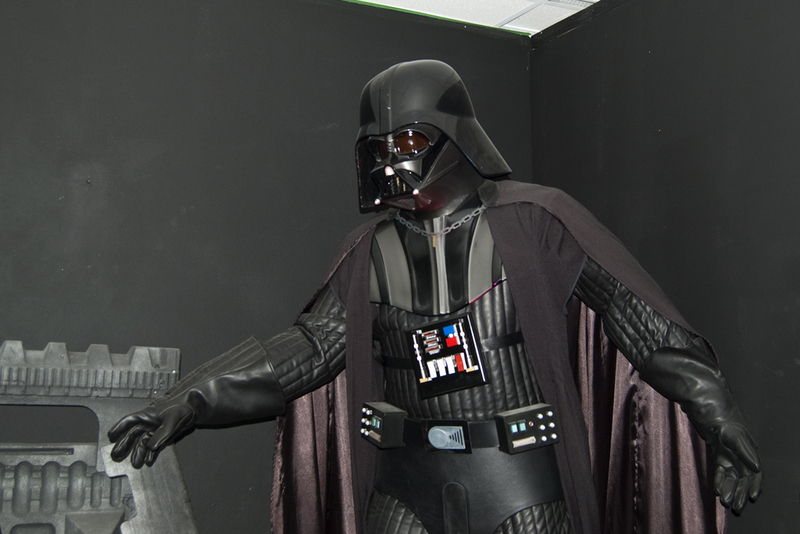 In the museum part were some of the full size costumes including Darth Vader and some masks of famous actors. 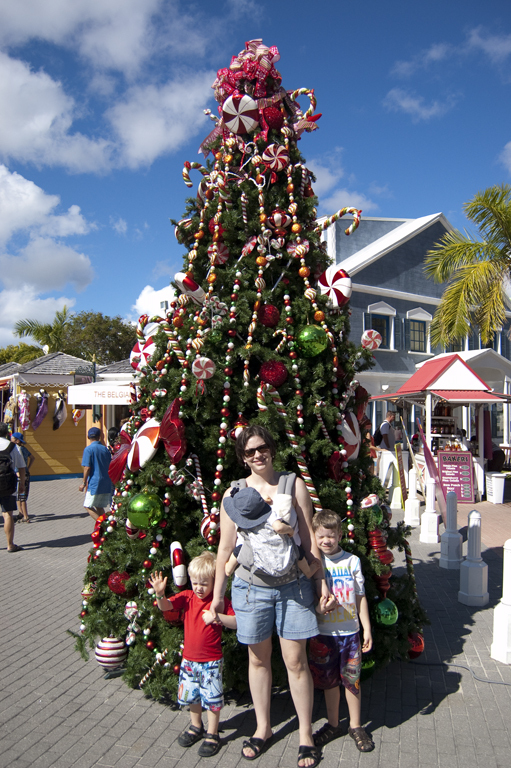 In the very touristy "port" where you get off the ships they had fun brightly decorated Christmas trees. This one and one in blues and purples. Poor boys, I forgot their sunglasses in the mad packing rush. 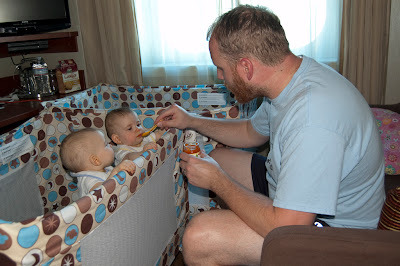 A late lunch for babies in the cabin... they didn't have to stand for their food most of the time, but it worked! And the two pack'n plays in the cabin meant we had very little extra space.... This is the first time I can ever remember actually unpacking while on vacation because there was no place for the suitcases to go other than under the bed! 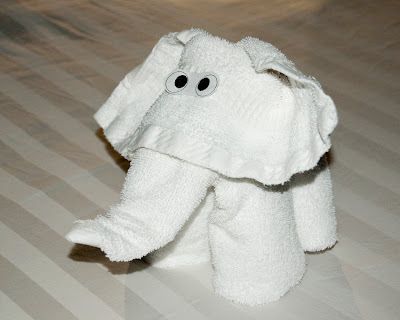 Our nightly animal... the elephant! Three days of port stops in a row was a bit much, the next day was at sea thankfully! The color of the waters, the sand, the calm (no waves) - it almost looks like the beach in Dubai! I wish I could go on a cruise in the Caribbean too!